Whether you’re cooking for a crowd, your family or for yourself, a delicious chicken curry with potatoes is always a crowd-pleaser. This quick and easy curry chicken recipe takes about 30 minutes to cook with instant curry paste, potatoes and yogurt. It’s great for days when you want a quick fix for homemade curry. 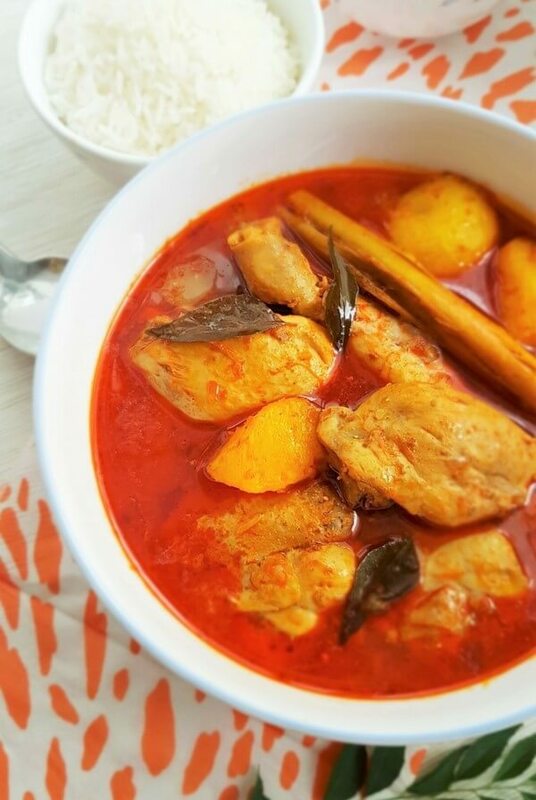 In one of my previous posts, I shared a Nyonya chicken curry recipe where I made curry from scratch by pounding and blending fresh spices manually. Although it was more time consuming that way, it was well worth the effort to me. However there’re times when I want a quickie homemade curry. Using an instant curry paste is the answer. It’s not only fast but super easy and delicious as well. 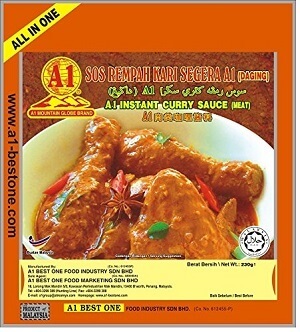 When it comes to instant curry paste, no two paste is alike in terms of taste and level of spiciness. 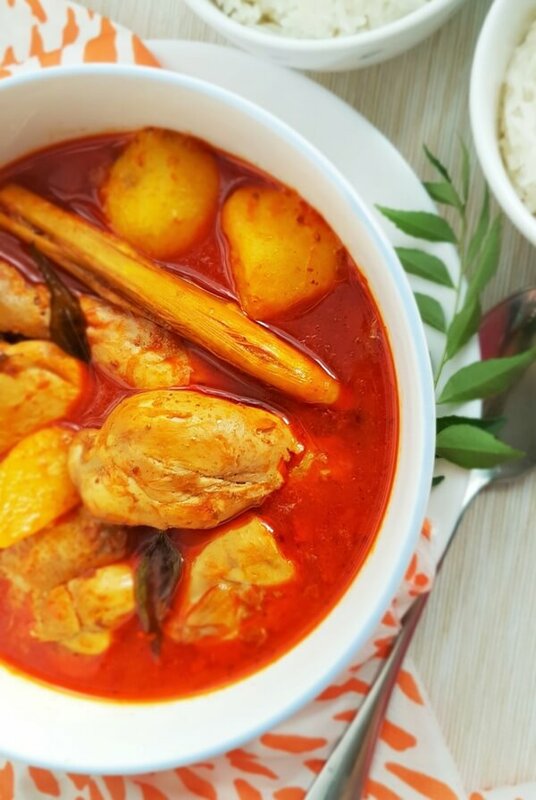 Use your favorite brand of instant curry paste for this chicken curry with potatoes recipe (I used A1) or experiment and find out which one you prefer. Some popular brands for curry paste include Baba and A1. In Singapore, they’re commonly available in dried goods stalls and supermarkets. I always scrutinize the ingredients list and try to avoid those that contain MSG. If you prefer a milder tasting curry, use half of the instant curry paste. Try not to skip the curry leaves and lemongrass in the recipe. The fragrance of lemongrass and curry leaves add warmth and depth to the flavors of the curry. Another ingredient I love to add in curries is yogurt. It gives the curry a hint of sourness and elevates the piquant taste. Yogurt also tones down the heat of the curry so my kids can enjoy it too. If you want, add some vegetables into the curry and make it a one-pot meal. Sometimes, I’ll throw in some ladies fingers, eggplant and tomatoes. My kids love the potatoes more than the chicken itself so whenever I cook curry, I’ll add more spuds into the pot. I like using my Happycall alumite pot when making a curry as the curry paste do not stick easily to the bottom of the pot when cooking. Leftover curry can be refrigerated for the day after. Curry is one of those dishes that tastes even better the next day like this Jiu Hu Char dish which I also adore. This bowl of delicious curry is perfect with steamed rice or bread. It’s definitely one of my favorite chicken dishes. Happy cooking! Don’t want to miss any new recipes? Subscribe to Souper Diaries newsletter and have the latest recipes and updates delivered to your inbox! Connect with me on Facebook, Instagram, Pinterest, Twitter and Google+. Quick and easy recipe for curry chicken with potatoes, prepared with tender chicken thighs, instant curry paste, lemon grass, curry leaves and yogurt for a slightly tangy taste. Heat oil in a deep pot. Stir-fry shallots till fragrant. Add lemongrass, curry leaves and curry paste and stir fry till it is fragrant and oil bubbles through. Keep the heat moderately low and be careful not to burn the paste. Add chicken pieces and stir to coat well with the curry paste. Fry for 3-5 minutes before adding water. Cover and bring to a boil. Once it starts boiling, add potatoes and simmer on low heat for another 10 - 15 minutes or until the chicken is tender and the potatoes are cooked through. Season with salt to taste. Turn off heat. Add yogurt a spoonful at a time and mix well. Serve immediately with some steamed rice or bread. 1. Adjust water as necessary. Use just enough to cover the chicken. 2. The yogurt will curdle if it is exposed to high heat so add it towards the end. I realy enjoy cooking, but have not ventured into Curry dishes. I’ll now be headed in that direction! Your recipe looks very inviting, and your tips to keep the heat down make this a must try for me. Thanks for sharing it. Oh man!! Every single thing I see on your site looks amazing!! I love Asian food!! I’m gonna save this recipe and try it out!! Thanks for sharing. I absolutely love chicken curry! I love the combination of the chicken, potatoes, rice, and the curry that it all sits in. I had the pleasure of having the real deal in Thailand and in the Philippines. The curry was so spicy that it made my eyes water and my nose run LOL. I have always wanted to learn how to make my own but i just could never find the right recipe. I’m very grateful to have found your website and will be bookmarking it immediately. Oooh .. that’s another delicious-looking meal. I love the “one-pot” idea as well, particularly when you can load it with vegetables like eggplant and tomato. I find that with something like curry, I have to get it just right. I don’t tolerate spices all that well but like a little zip to the food. But if the spice goes too far, it’s too hot for me and I lose the rest of the flavor of it. So I appreciate the recipe to follow! If you can’t tolerate spices too well, you may want want to use less of the instant curry paste. Adding yogurt will also help to tone down the heat of the curry. Hope that helps. This recipe looks nice and easy and I love that it can be done in 30 minutes! I love curry but not made it with yogurt before…mm that sounds interesting. I think I will experiment with that. Yvonne, I love curry and have the ingredients to this one on my next grocery list. The photos really add. I will then be able to know how mine is by referring to the pictures. I see you took them. They are really good. I also enjoy left over curry the next day. Good work and thanks, again, for the recipe. It looks really easy and I will definitely try this when I am in suburbs of Thailand. Well, I actually have to. I sometimes can’t find food courts due to my working hours. I like mild curries, so adding the yogurt will be perfect for me. Thanks for the recipe. Hi, Yvonne! Nice site. People love food, right. I love curries too. I’m with everyone else. Pics are great and you make it sound simple. I like simple and quick recipes. I have a curry chicken recipe, but not Asian. So I will definitely yours a try. This recipe looks like it will be easy to follow. I love curry. Do you know the difference between red curry and green curry? Is on hotter than the other. I use the flavor packets also, but I would like to learn how those Asian ladies know how to make curry from memory! It is always so good! Could you make this recipe in bulk and freeze it in portions? I’ve seen some differing views on whether red or green curry is hotter. I would say it depends on the amount of chilies used by the cook. Yes, you can make this in bulk and freeze it in portions. I love the idea of making my own curry paste, and it is a goal of mine this year. However, I am often very strapped for time, so using a pre-made curry paste is the only option (unless we want to eat dinner at midnight!). This sounds like a great easy curry recipe, and I look forward to giving it a try – I’ve already pinned it! I absolutely love Chicken Curry and those pictures look so appetizing. Curry paste is always the way that I go when I make a curry because I am always strapped for time. However, I have never tried the curry leaves, so I will give them a try next time. That recipe sounds super easy to follow, even for an amateur like me. I will definitely be giving it a go next chance I get. Pictures say a thousand words, and today you have said a MILLION! I absolutely love the pictures of this particular recipe in this post. They really have captivated my interest and I found myself reading on just to get to the next fabulous picture. Did you take these pictures yourself? The whole format is nice as well a very colorful read all round! I will definitely be trying this recipe only in the hopes it looks anything like that of the one in this article. This looks so good! I love that it’s quick and easy as I don’t always have a lot of time to get dinner on the table. Can’t wait to try it! Yes, it’s really quick and easy and delicious as well! Hope you’ll like it. I LOVE curry! I’m going to try this easy curry chicken recipe and tell you how it goes for me! 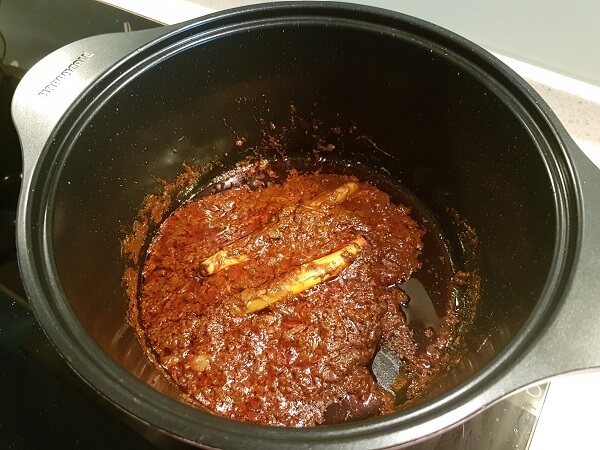 Yvonne, thank you for sharing a delicious looking curry. It is also a blessing that it is so easy to prepare. I usually use the curry powder. Is there a difference in taste? Nice site. I personally prefer to use curry paste compared to curry powder. Yes, there’s difference in the taste. Please use curry paste and not curry powder for this recipe. Curry powder is more suited for Indian curries. Wooow, this recipe looks sooo good! I’m not a huge fan of curry or similar foods, but this ones really makes me want to try it. And the preparation time is so little, just 40 minutes! I don’t like dairies too much, so what do you think, could I skip adding the yogurt? Or it’s an essential ingredient? Yes, you may skip the yogurt if you don’t like dairy products. I would love to know how this recipe turns out for you! Thanks for writing in. Hi, and thanks for sharing this chicken curry recipe with me. I love chicken and curry so this may be a recipe that will suit me well. I really love your images. They are detailed and fresh and colorful. You make me want to make this recipe. I think I made a mistake clicking into your page. It’s close to dinner time, I’m hungry and that glorious image of curry chicken doesn’t help. I do cook occasionally but I have not attempted curry chicken. Your recipe will definitely come in handy when I put on my cooking apron again.